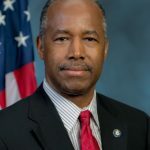 Benjamin Carson is an American neurosurgeon, author, and politician who is the 17th and current United States Secretary of Housing and Urban Development, under the Trump Administration. Prior to his cabinet position, he was a candidate for President of the United States in the Republican primaries in 2016. Born in Detroit, Michigan, and a graduate of Yale University and the University of Michigan Medical School, Carson has authored numerous books on his medical career and political stances. He was the subject of a television drama film in 2009. "In my own personal life, God plays a great role in the risk, because I pray before I go into the operating room for every case, and I ask him to give me wisdom, to help me to know what to do – and not only for operating, but for everything." "When I entered high school I was an A-student, but not for long. I wanted the fancy clothes. I wanted to hang out with the guys. I went from being an A-student to a B-student to a C-student, but I didn’t care. I was getting the high fives and the low fives and the pats on the back. I was cool." "I actually don’t think that I’m that much smarter than anybody else. It’s just that I frequently just seem to know what to do, and I think that’s wisdom." "Don’t let anyone turn you into a slave. You’re a slave if you let the media tell you that sports and entertainment are more important than developing your brain." "There’s no question that as science, knowledge and technology advance, that we will attempt to do more significant things. And there’s no question that we will always have to temper those things with ethics." "Evolution and creationism both require faith. It’s just a matter of where you choose to place that faith." "There is no fulfillment in things whatsoever. And I think one of the reasons that depression reigns supreme amongst the rich and famous is some of them thought that maybe those things would bring them happiness. But what, in fact, does is having a cause, having a passion. And that’s really what gives life’s true meaning." "We are more than just flesh and bones. There’s a certain spiritual nature and something of the mind that we can’t measure. We can’t find it. With all our sophisticated equipment, we cannot monitor or define it, and yet it’s there."